The first cover version of the song was recorded by the Los Angeles band The Byrds on their 1969 album, Ballad of Easy Rider. The song was later recorded by The Doobie Brothers, who included it on their 1972 album, Toulouse Street. The Doobie Brothers' version of the song was released as a single in November 1972 and it became a hit in the United States, peaking at No. 35 on the Billboard Hot 100. In 1973, American rock band Exile released their self titled debut album which included a cover. In 1992, the Christian rock and hip hop group, DC Talk, released a version of "Jesus Is Just Alright" on their Free at Last album. The song has also been covered by Robert Randolph on his Colorblind album, with guest artist Eric Clapton and Stryper's 2013 release, No More Hell to Pay. (1969) "Jesus Is Just Alright"
The Byrds' version of "Jesus Is Just Alright" was recorded on June 17, 1969 during the sessions for the band's eighth studio album, Ballad of Easy Rider. It was first released as part of that album but was subsequently issued as a single on December 15, 1969. The single stalled at No. 97 on the Billboard Hot 100 and failed to chart in the United Kingdom. Despite this lack of commercial success, The Doobie Brothers' later hit version of the song featured an arrangement that was heavily influenced by The Byrds' own recording. The song was introduced to The Byrds by the band's drummer, Gene Parsons, who had been present in the studio when The Art Reynolds Singers had recorded it. The Byrds had added the song to their live concert repertoire some months prior to the start of the Ballad of Easy Rider recording sessions and it had quickly become an audience favorite. In concert, The Byrds rendition of "Jesus Is Just Alright" began with a wordless vocal introduction that built up and led into the first iteration of the song's chorus. This distinctive vocal arrangement had been devised by Parsons but once the band were in the studio, record producer Terry Melcher dispensed with this extended intro, choosing instead to give the song a more pop-oriented arrangement. 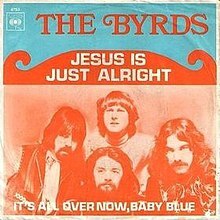 "Jesus Is Just Alright" became a staple of The Byrds' concert repertoire between 1969 and 1971 but appears to have been performed only rarely after that. Additionally, the band performed the song on the U.S. television programs Memphis Talent Party and The Midnight Special in 1970 and 1972 respectively. Besides its appearance on the Ballad of Easy Rider album, "Jesus Is Just Alright" can also be found on several Byrds' compilations, including The Best of The Byrds: Greatest Hits, Volume II, History of The Byrds, The Byrds, The Essential Byrds, and There Is a Season. Live recordings of the song are included on the expanded edition of The Byrds' (Untitled) album as well as on Live at Royal Albert Hall 1971. 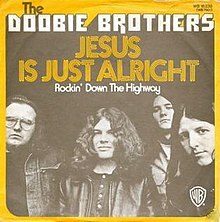 (1972) "Jesus Is Just Alright"
The Doobie Brothers' version of "Jesus Is Just Alright" was first released on their second album, Toulouse Street, in 1972. It was subsequently released in November 1972 as the second single from the album (b/w "Rockin' Down the Highway") and went on to become a U.S. hit, peaking at No. 35 on the Billboard Hot 100 in February 1973. The single featured a shorter, edited version of the song compared to the one included on the album. The Doobie Brothers' version of "Jesus Is Just Alright" was one of a number of religiously themed songs to reach the U.S. charts between 1969 and 1973, along with "Spirit in the Sky" by Norman Greenbaum, "Put Your Hand in the Hand" by Ocean, "Superstar" by Murray Head, "Morning Has Broken" by Cat Stevens, "Jubilation" by Paul Anka, "Speak to the Sky" by Rick Springfield, "Jesus Was a Capricorn" by Kris Kristofferson, "My Sweet Lord" by George Harrison and "I Knew Jesus (Before He Was a Star)" by Glen Campbell. The song, along with its B-side, continue to be a staple of playlists on classic rock radio stations. The band first became aware of "Jesus Is Just Alright" after hearing The Byrds' version and before long the song had been added to The Doobie Brothers' own live repertoire. As a result, the song's musical arrangement is very similar to the one used by The Byrds, although The Doobie Brothers' rendition does include an extra bridge that the band added themselves. Although none of the individual band members were religiously inclined, the song went on to become very popular among Christians during the early 1970s, particularly those within the hippie counterculture that were involved with the Jesus movement. In addition to its appearance on Toulouse Street, the song can also be found on a number of Doobie Brothers' compilations, including Best of The Doobies, Listen to the Music: The Very Best of The Doobie Brothers, Long Train Runnin': 1970–2000, Greatest Hits, and The Very Best of The Doobie Brothers. Live recordings of the song appear on the Farewell Tour, Rockin' down the Highway: The Wildlife Concert, and Live at Wolf Trap albums. 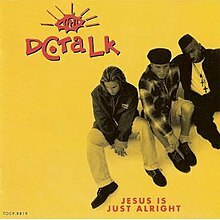 (1992) "Jesus Is Just Alright"
"Jesus Is Just Alright" is a Dove Award-winning single by Christian rock and hip hop band, DC Talk. It was the lead single for their 1992 platinum-selling and Grammy Award-winning album, Free at Last. The band's primary songwriter, TobyMac (Toby McKeehan), retained the song's chorus but added a number of new verses consisting of his own lyrics. These lyrics were rapped, as was usual with DC Talk's songs of the period, with the lead vocal alternating between McKeehan's rapped verses and the sung chorus provided by Kevin Max (then known as Kevin Smith) and Michael Tait. DC Talk's version also includes subtle lyric alterations, with the line "Jesus is just alright" being intermittently changed to "Jesus is still alright". Thus, DC Talk's recording can be seen as something of an update on the previous version. McKeehan changed the line in an attempt to express his feeling that Jesus was still alright with him even if many others did not share his beliefs. The song's lyrics also comment on the lack of acceptance and recognition that faith-based music often receives from mainstream radio. In addition to being musically based upon the earlier Byrds and Doobie Brothers' recordings, DC Talk's version of the song also features samples of Madonna's hit single "Vogue" and the Snap! song "The Power". In the audio commentary of the Free at Last – The Movie bonus DVD, Tait identified "Jesus Is Just Alright" as the song that DC Talk have performed most in their live shows. It has been played at every concert since 1992 and is the only song to be played on each of their four major headlining tours: Free At Last (1994), Jesus Freak – The Tour (Spring 1996), The Supernatural Experience (Spring 1999), and An Evening with DC Talk (Spring 2001). The song's music video was shot entirely in muted sepia-tone and featured DC Talk singing around three crosses in a desert, surrounded by musicians and dancers. It concludes with the band walking off into the desert sunset. At the 24th GMA Dove Awards in 1994, "Jesus Is Just Alright" was awarded the Dove Award for Best Rock Recorded Song. DC Talk also became one of the first contemporary Christian acts to perform on late-night television when, on November 12, 1993, the band performed "Jesus Is Just Alright" on The Tonight Show with Jay Leno. ^ Hjort, Christopher. (2008). So You Want To Be A Rock 'n' Roll Star: The Byrds Day-By-Day (1965–1973). Jawbone Press. p. 204. ISBN 1-906002-15-0. ^ "Art Reynolds Biography". CD Baby. Retrieved February 17, 2010. ^ "Jesus Is Just Alright – Cover Versions". AllMusic. Archived from the original on March 10, 2010. Retrieved February 17, 2010. ^ a b c d e Rogan, Johnny. (1998). The Byrds: Timeless Flight Revisited (2nd ed.). Rogan House. pp. 300–301. ISBN 0-9529540-1-X. ^ a b c "Toulouse Street review". AllMusic. Retrieved February 17, 2010. ^ a b "The Doobie Brothers Billboard Singles". AllMusic. Retrieved February 17, 2010. ^ "Exile (7) - Exile". Discogs. Retrieved November 4, 2018. ^ a b "Free at Last review". AllMusic. Retrieved February 17, 2010. ^ "Colorblind review". AllMusic. Retrieved February 17, 2010. ^ "Stryper: Audio Samples Of Three 'No More Hell To Pay' Songs Available For Streaming". Blabbermouth.net. August 22, 2013. Retrieved September 16, 2013. ^ Rogan, Johnny. (1998). The Byrds: Timeless Flight Revisited (2nd ed.). Rogan House. pp. 626–627. ISBN 0-9529540-1-X. ^ Rogan, Johnny. (1998). The Byrds: Timeless Flight Revisited (2nd ed.). Rogan House. pp. 544–547. ISBN 0-9529540-1-X. ^ "The Byrds Billboard Singles". AllMusic. Retrieved February 17, 2010. ^ Hjort, Christopher. (2008). So You Want To Be A Rock 'n' Roll Star: The Byrds Day-By-Day (1965–1973). Jawbone Press. p. 214. ISBN 1-906002-15-0. ^ Rogan, Johnny. (1998). The Byrds: Timeless Flight Revisited (2nd ed.). Rogan House. p. 617. ISBN 0-9529540-1-X. ^ a b "Jesus Is Just Alright by The Byrds". AllMusic. Retrieved February 17, 2010. ^ Whitburn, Joel. (2008). Top Pop Singles 1955–2006. Record Research Inc. p. 252. ISBN 0-89820-172-1. ^ McNichol, Tom (December 24, 2006). "A 'Spirit' From the '60s That Won't Die". The New York Times. Retrieved May 20, 2013. ^ "Ocean: Awards". AllMusic. Retrieved May 20, 2013. ^ Whitburn, Joel (2003). Top Pop Singles (1955–2002). Wisconsin: Record Research Inc. p. 307. ISBN 0-89820-155-1. ^ Cusic, Don. (2002). The Sound of Light: A History of Gospel and Christian Music. Hal Leonard Corporation. pp. 241–242. ISBN 0-634-02938-X. ^ a b c "Jesus Is Just Alright by The Doobie Brothers review". AllMusic. Retrieved February 18, 2010. ^ Wilson, Jared C. (2009). Your Jesus Is Too Safe: Outgrowing a Drive-Thru, Feel-Good Savior. Kregel Publications. p. 13. ISBN 0-8254-3931-0. ^ Michael Tait (2002). Free at Last — The Movie (audio commentary) (DVD). ForeFront Records. ^ "Dove Awards History". GMA Dove Awards. Archived from the original on June 5, 2012. Retrieved February 17, 2010. This page was last edited on 1 April 2019, at 06:11 (UTC).